My partner’s Mum makes this Crunchy Asian Noodle Salad all the time and it is just amazing. So very easy, so very tasty and oh my lordy so very munchy! Such a simple recipe that everyone will love. If it’s just the two of you prep everything and set aside half the cabbage mix leaving out half the nuts, noodles and dressing for the next day you serve it up (prevents serious sog factor). In a wee frypan gently toast your almonds until lightly tanned, remove from heat and set aside to cool. Remove the hard end of the wombok (love that word) and slice the cabbage in about 1cm thick pieces (for the tough bits chop a little smaller). Slice up the escahllots and toss together with the cabbage. In a large jam jar or whatever you use to shake your salad dressings about in add all of the dressing ingredients. Shake it (with lid on like a maraca until sugar has dissolved). Just before serving dress the wombok mix, add the almonds and noodles and toss a little more. Serve up and munch out! 2 tsp hot english mustard, not generous, flat. In a large pot add the halved/chopped potatoes, a little salt and cold water (enough to drown the spuds), cover with lid and bring to a boil. Continue cooking until potatoes are soft enough to skewer with a knife. If you’re not sure, take one out and try it. Potatoes should be just cooked, they will continue to cook a little while longer as they cool on the bench. Careful not to overcook you don’t want floury potatoes. Meanwhile under a high temperature on your grill, cook the bacon pieces. Keep an eye on them, they can burn pretty easily. Also (now you’re multitasking) pop the eggs on to hard boil too. In a large mixing bowl combine the mayonnaise, lemon juice, mustard, salt and pepper and whisk til smooth. Then add the onion, mushrooms and chopped parsley. Pop in the potatoes and cover with the sauce then stir through the bacon and eggs. Cover bowl with glad wrap/cling film/plastic wrap and pop in the fridge to chill. 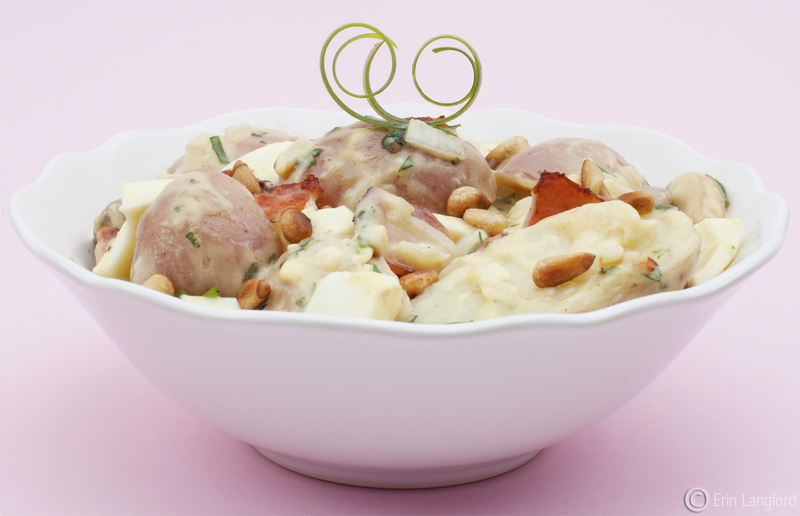 Just before serving put the potato mix into your favourite salad bowl and top with the pine nuts and eschallots. Handy Hint: Serve this salad in a more flat salad dish/serving tray (nothing to steep) as you don’t want all that gorgeous sauce sitting in the bottom of the dish and dry potatoes on the top. Also I’ve had this in the fridge for three days and was still super tasty, I reckon it could go another two. I came across this really interesting sounding recipe via Twitter feed by Cooking with Quinoa author Wendy Polisi (@cookingquinoa) after she started following me (@munchglutenfree) and my mouth started watering instantly! Made the recipe within a few ours of the discovery and had to substitute a few bits due to availability in Australia, the only thing I will change next time with regards to flavour is to add fresh coriander leaves, as I reckon it will really help it sing. Prepare your quinoa as you normally would (I microwave mine to 2 cups of water for about 15 minutes). Except instead of cooking plain, add the first set of ingredients and then after cooking allow to sit covered for an additional five minutes. Meanwhile, in a small bowl combine lime juice, olive oil, honey and tobasco sauce. Whisk until well combined. 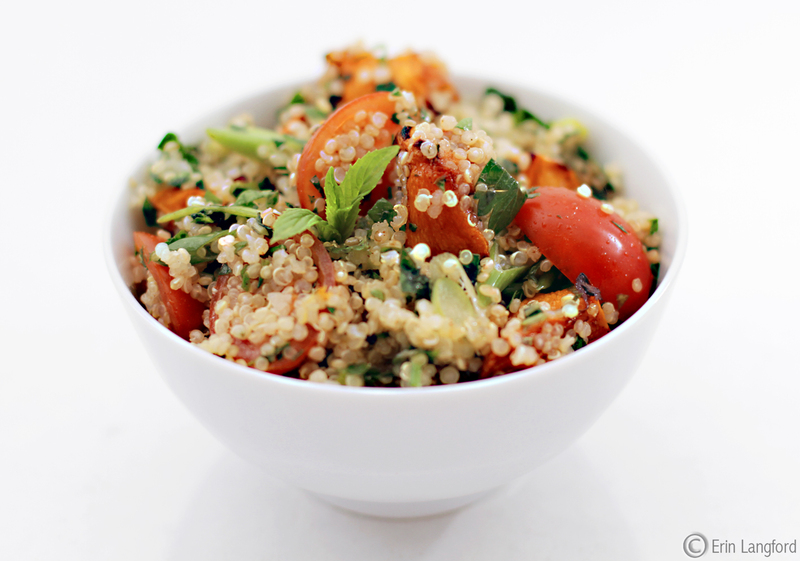 In a large bowl combine cooked quinoa, beans, tomatoes, red onions, eschalots and avocado. Toss with dressing and top with pine nuts. Handy hint: Avocado tends to go brown if left out for too long, although the citrus juice should stop it from discolouring I would add the avo just before serving up. Also with these style of Quinoa salads, the earlier you make it in the day the better it tastes as the little quinoa balls are able to absorb all those amazing flavours better. 2nd Handy Hint (you lucky ducks): Pine nuts are amazing in simple green/green/garden salads. Instead of going through the effort of toasting them each time you make a salad, the first time you open the pack, toast them all at one and then store the rest in a plastic container, they really add another flavour dimension to simple salads and they’re good for you. To toast, simply pop a fry pan on a low heat (no oil or anything) and sprinkle in the nuts, gently warm them until they get a little colour and then take off the heat and allow to cool. I have recruited the lovely Nigella Lawson this evening and her salad is a knockout. So I used a bought BBQ Chicken. This is such a great little dish – no stove, no pots, no cooking. The secret to a really flavoursome glass noodle salad is too make sure the noodles are well and truly drained, sticky, not slippery. First make the dressing by mixing all the dressing ingredients together. Use an old jam jar with a lid – handy for really mixing the ingredients together. Soak the noodles in a large bowl in freshly boiled water (from a kettle) until they look clear when you hold them up singly. Refresh the noodles in cold water, then drain. Pop them back into the large bowl once thoroughly drained. Put the sugar snaps into an bowl and pour over boiling water from a kettle. Let them sit for about two minutes or so. Add beansprouts after a minute. Drain. Add the eshallots and onion to the noodles and mix the dressing and toss until all of the noodles are coated. This may take a bit as each noodle considers the other its best friend and it can be hard to get the dressing into the middle of the noodle pile at first. Now add the chicken, beansprouts and sugar snap peas and toss some more. Sprinkle the chopped coriander over and toss everything together well before arranging on a large plate or in a bowl. Handy Hint: Nigella says the dressing can be made and kept in a tightly sealed jar in the fridge for up to 2 weeks. Another Handy Hint: Check your ml guide on your measuring spoons as Nigella says in her recipe 1tbs (15 ml) my own measuring spoons I bought here in Australia say 1 tbs (20 ml). 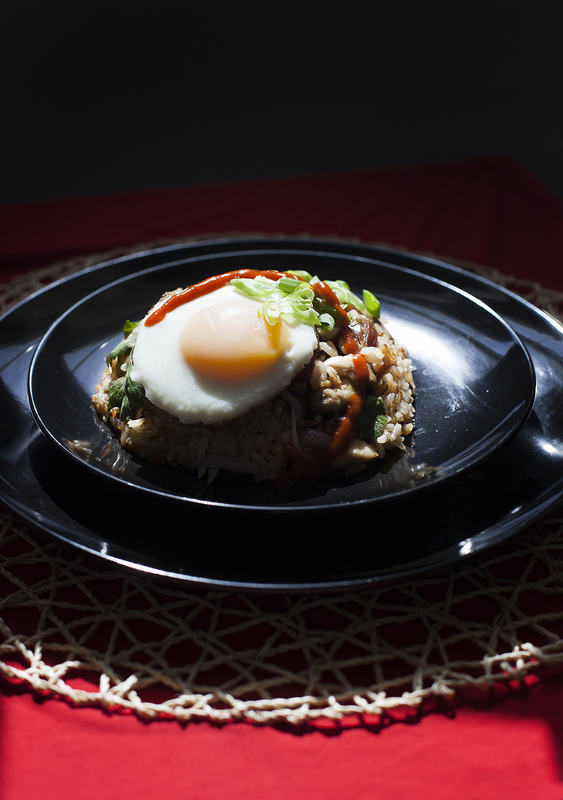 You want to make sure you don’t add too much especially when using strong sauces like Fish Sauce – eek. I just love this salad. We eat this most weeks accompanied by a piece of grilled salmon fillet. The zesty tang of the salad helps cut through grease, so perfect for eating with oily fish or BBQed meats. I found the recipe on the Gluten Free Goddess site, and adapted it to make it a little more filling with the Roasted Paprika Pumpkin. Place oven on about 180 degrees. Chop the pumpkin and spray with olive oil and sprinkle with paprika. Pop in the pumpkin in the oven to roast away whilst you do the rest. In a microwave safe dish place one cup of uncooked rinsed quinoa to 2 cups of water, stir with a fork and cook uncovered for 15 minutes. Remove from the microwave and cover the quinoa and let it stand on the bench for at least 15 minutes (the longer is stays covered the more fluffier and lighter the quinoa will become). Once the quinoa is cooked just add the rest of the ingredients and gently fork through. Easy Peasy. Handy Hint: If you can make this salad several hours before, do, it means the Quiona can absorb all the flavours. I have had it last in my fridge for four days and it’s tasted great. Just like Spaghetti the older it is, the better it tastes! You can also add some more vegetables like capsicum and beans to the mix to make it more filling.